The Shark Lord didn’t go over as well with the Disney execs. Their loss. Oh the things that could be done if I were good at Photoshop. Great. I ‘m so curious now! Ooooooo, if only I knew how to make a proper .gif. I could totally learn it. The image below is amazing. Yes, it is indeed amazing, the profound miracle of life exemplified in the birth of our precious new Shark Lord. Truly a day we will never forget. I do feel a bit sorry for him. I really like that flish’s color scheme too. Red flish, blue flish, poor flish, uh… coo’ flish? I quite enjoy the bit with the flish, the expressions are what really sells it for me. I like how Skärva’s little finger is pointed out when attached to the mast. The first moment I saw the first panel I thought of the Goldgills and Lorelei doing the Lion king thing. 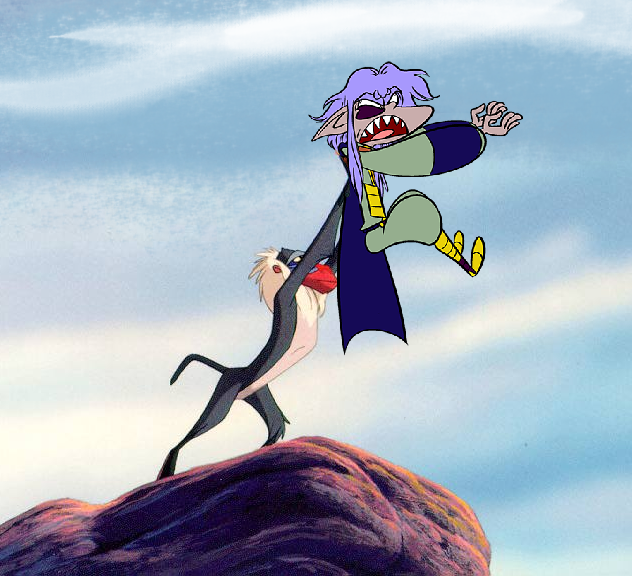 I guess Skearva wanted to do the Lion king thing more. I can’t remember whether this has been mentioned before or not, but is there a king? The only royal we ever see is the princess. For some reason I can’t help but think of that song from the ‘songs of muppet treasure island’ that was an extra one “I’m a real pirate”. Also it’s probably partly the gods hating on him but I can’t help but feel Skarva is constantly in situations he can’t stand. The mansion, the volcano, the bard, and now the pirates. He’s miserable so often. Muppet Treasure Island, yay! I’m going to go watch that again now, thanks. …My entire week has been made with this. Also, Skearva looks like a koala. 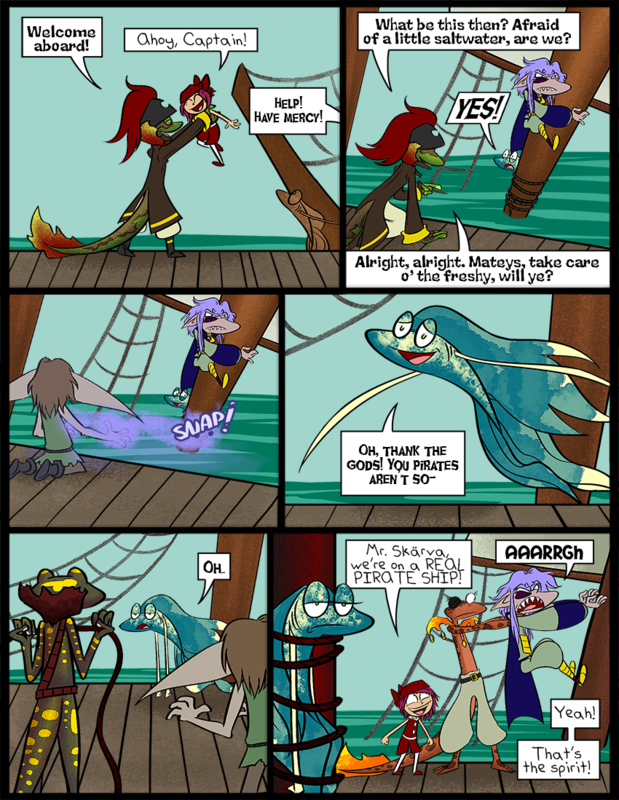 Poor Skaerva. He just can’t wait to be king! Hey, that is actually rather good. Eep~! I love the way you draw him; thank you so much! He know the trope is coming to get him. He simply can’t escape the plot even if he knows it is working against him. Wow, I only discovered this comic recently, and I’ve read through all of it to the recent update. IT’S SO GREAT. I CAN’T WAIT FOR MORE. Welcome! We’re glad to have you around! I’m glad you like it so far; it’s only going to get better and better!